your letter dated January 26, 2011 and thank you. The report of the European Commission of 22 December 2010 on "The memory of crimes committed by totalitarian regimes in Europe '* highlights the diversity of laws of Member States in this area. Member States have adopted measures different depending on their history and their national circumstances. Even among Member States which have suffered the same kind of totalitarian regime, instruments and measures selected may be very different. Given this disparity and limited powers of the European Union in this area, the Commission considers that the conditions for action legislate in those areas does not currently exist. In its report, the European Commission also stresses the importance for the Union and contributes, within its competence, to promote the memory of the crimes committed by totalitarian regimes in Europe. The European Commission considers that important gaps in knowledge of the totalitarian past of all Member States, notably as regards the period during which Europe's Western and Eastern Europe has experienced two different experiments. On behalf of the Vice-President, Mrs. Viviane Reding, I thank you for your letter dated 25 February 2011 in response to my letter of 22 February 2011. In your letter you are referring to the importance of the Holocaust. I can only share your opinion on this point and remind you that the report of the European Commission on December 22, 2010 "The memory of the crimes committed by totalitarian regimes in Europe " clearly expresses the will of the European Commission to utilize its financial programs to help any interested parties to safeguard and promote the memory of the crimes committed by the totalitarian regimes, including crimes of Nazism. Among these programs, the first report of the European Commission says the program "Europe for the Citizens” which includes the Action 4" An active European memory ", aims to maintain the memory of victims of Nazism and of Stalinism and improve the knowledge of what happened in the camps and other mass murder sites of civilians. This action supports projects to preserve the main sites and memorials associated with the mass deportations of civilians, the former concentration camps and other sites of martyrdom and of large-scale extermination of Nazism, as well as the archives relating to these events, and maintain the memory of the victims, and also the remembrance of those who in these extreme conditions, rescued people from the Holocaust. In Hungary the left side Government voted a law prohibiting the denial of Holocaust on 23 February 2010, which was dismantled on 8 June 2010 by the new elected rightist and authoritarian government of Viktor ORBAN. In a new law the word Holocaust was deleted and replaced by the word genocides committed by the communists and the Nazis. In Hungary 74% of the 596 000 Jews was exterminated principally from 1944 to 1945. Hungary as Lithuania cannot mention in no way anything similar which might be called genocide. 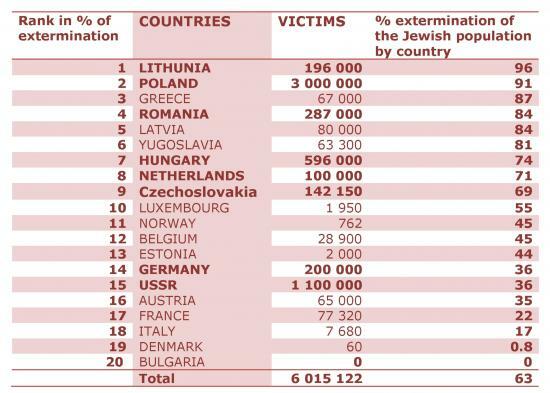 We must also note the significant Hungarian participation to the extermination of Jews.